Emmanuel Macron wins: What’s ahead for France? In a pointed endorsement of European unity, Macron strode to the stage at his raucous victory party in the grand central courtyard of Paris’s Louvre Museum on Sunday night to the strains of Beethoven’s “Ode to Joy” theme, the European Union’s anthem. 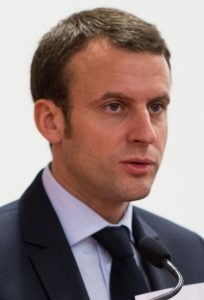 Former U.S. presidential candidate Hillary Clinton, American civil rights leader Jesse Jackson and New York mayor Bill de Blasio, among others, congratulated Macron and the people of France for the presidential election result. “Your victory is a victory for a strong and united Europe and for French-German friendship,” German Chancellor Angela Merkel’s spokesman said in statement. European Union leaders also offered congratulations to Macron: “Happy that the French chose a European future,” European Commission President Jean-Claude Juncker wrote on Twitter. When Europe looks calm and sorted, its not. Nothing is actually fixed.. For all the happy posts this morning about Euro strength, which stocks to buy on the basis of French recovery, and the rest… I doubt it. Although there is apparently nothing to worry about in Euroland anymore – we’ve still got the festering pustule that is Italy, episode 47 of the Greek Crisis on our doorsteps, and the who knows what coming from the Brexit negotiations. Europe will continue to amuse, fascinate and frustrate..
PARIS — … the election victory of Emmanuel Macron, a 39-year-old liberal (in American parlance, anyway) has drawn a sigh of collective relief from all corners but the far-right. Even American centrists and more conservative Washington Republicans may take comfort that the Old World has not lost all perspective. Many feared the anti-immigration, protectionist and isolationist tide that recently swept over the U.S. presidential and British European referendum votes could spread to mainland Europe, but in this era of polarization — for now, at least — the political center has held. As a result, from a defense and economic perspective, the U.S. can still rely on its European Union (EU) ally. Macron supports staying in the EU, while his defeated opponent, Marine Le Pen, was adamantly against it. With some 500 million consumers, the EU is a massive market for U.S. goods, and the bloc remains the biggest single U.S. trading partner. President Trump’s Commerce Secretary Wilber Ross has prioritized opening trade talks with the EU. So, what’s ahead for France? Thus, unlike some in LCG, Dibar Apartian realized that some of the Israelitish nations would be part of the Beast and will betray the sons of Joseph (Ephraim and Manasseh; see also Anglo – America in Prophecy & the Lost Tribes of Israel). This leader is described as a warring man who essentially changes religion and gets people to ultimately worship him. France will initially support this Beast power. The Bible also shows that this beast Bower will have a “great army” (Daniel 11:25) and specifically eliminate the nominally Protestant USA (Daniel 11:39) and then the predominantly Muslim nations of the Middle East and North Africa (Daniel 11:40-43). Later, Russia will be a problem for him (cf. Daniel 11:44). 4 And I heard another voice from heaven saying, “Come out of her, my people, lest you share in her sins, and lest you receive of her plagues. 5 For her sins have reached to heaven, and God has remembered her iniquities. 6 Render to her just as she rendered to you, and repay her double according to her works; in the cup which she has mixed, mix double for her. 7 In the measure that she glorified herself and lived luxuriously, in the same measure give her torment and sorrow; for she says in her heart, ‘I sit as queen, and am no widow, and will not see sorrow.’ 8 Therefore her plagues will come in one day — death and mourning and famine. And she will be utterly burned with fire, for strong is the Lord God who judges her. And at least some of Reuben will resist (see Revelation 7:1-5). France itself, will end up with problems from the European King of the North Beast power, after a time. Notice that after 1/3 is destroyed by fire (perhaps a reference to nuclear or other weapons of mass destruction), a third struck by other weapons, and one-third will be scattered, then there is other fire and after all of that, “fire will go out into all the house of Israel.” This will affect France! Some have wondered if Israelitish-descended nations such as France could be part of the final Beast power. Yet, history shows us that France was part of the old Roman Empire and parts of it were part of the so-called ‘Holy Roman Empire.’ The fact that at least part of France was part of the beasts in Daniel 2:40-43 and 7:2-8, should show all that it, for a time, can be part of the final Beast power. But the French will ultimately be hurt by it. This entry was posted on Monday, May 8th, 2017 at 6:00 am	and is filed under Prophecy.